GANDERBAL 02 April :- Department of District Youth Services and Sports Ganderbal today organised District level Annual Long Distance Road Race for Boys under 14, 17 and 19 Years in which 500 students from all government and Private Schools of the district participated. 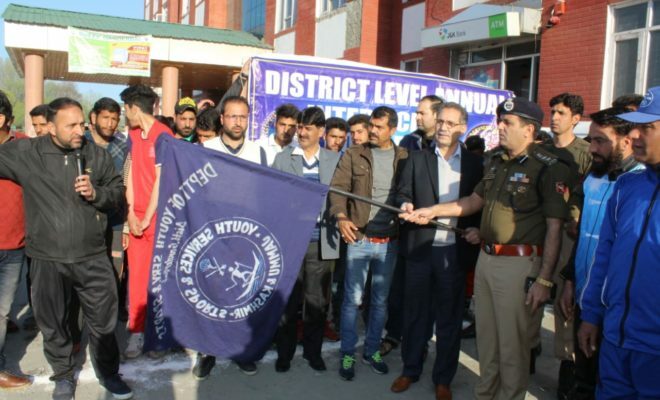 The Race was flagged off by Deputy Commissioner Ganderbal, Hashmat Ali Khan along with SSP Ganderbal, Khalil Poswal from Mini Secretariat Ganderbal and Culminated at the main gate of Sports Stadium Gadoora, Ganderbal. The same race for Girls in all age groups will be held tomorrow from same venue and will also culminate at the same point. The first 03 Position holders under 14, 17 and 19 Years were given prizes by the ADC Ganderbal, Showkat Ahmad who was Chief Guest at the presentation Ceremony. Speaking on the occasion, District sports officer, Daharam Veer Singh said more activities will be organised in near future. He further informed that the position holders of the today’s event will participate at Province level to represent district Ganderbal. District Sports Activities Incharge, Mohd Maqbool and other officials of the department were also present on the occasion. Earlier, students were sensitized about VVPAT by Master Trainer under SVEEP initiative.